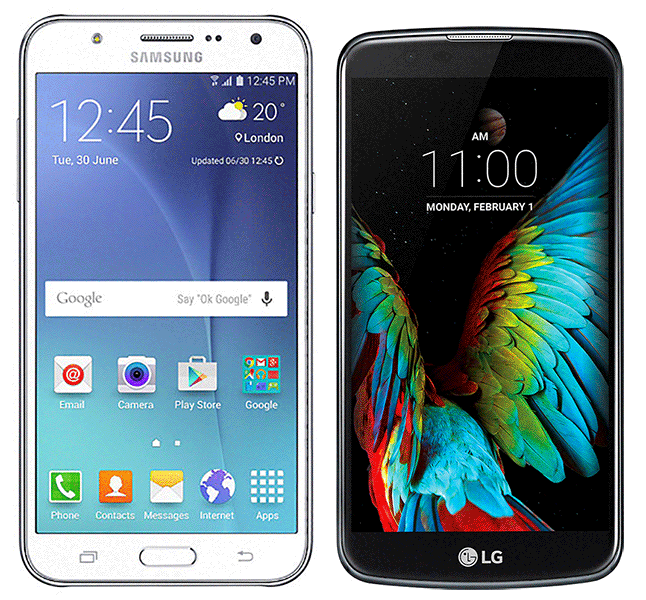 It looks like a couple of new Android phones are coming to T-Mobile next week. 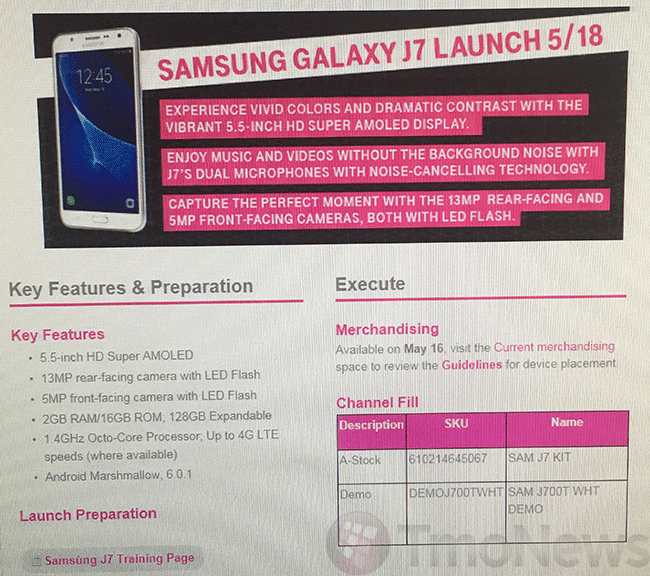 According to images sent to TmoNews by an anonymous source, T-Mobile will launch both the Samsung Galaxy J7 and LG K10 on May 18. Neither phone has been officially announced by T-Mobile, but a recent leak did suggest that both phones will be coming to T-Mobile in the late May to early June timeframe. The Galaxy J7 will come to market with a 5.5-inch HD Super AMOLED display, 13-megapixel rear and 5-megapixel front cameras (both with LED flash), 16GB of storage, a microSD slot, an octa-core processor, and 2GB of RAM. Also included with the J7 is Android 6.0.1, the latest version of Marshmallow. Meanwhile, the LG K10 will pack a 5.3-inch HD display, 8-megapixel rear and 5-megapixel front cameras, 16GB of storage, a microSD slot, and a 2200mAh battery. There’s no pricing info available for either of these Android phones, but considering their spec lists, I wouldn’t think that either will be too hard on buyers’ wallets. If these two phones are indeed launching on May 18 as the internal documents suggest, we’re only nine days away from seeing them hit store shelves and all of their details laid bare. Stay tuned. Wow, I like them both. Lots of options on phone today! 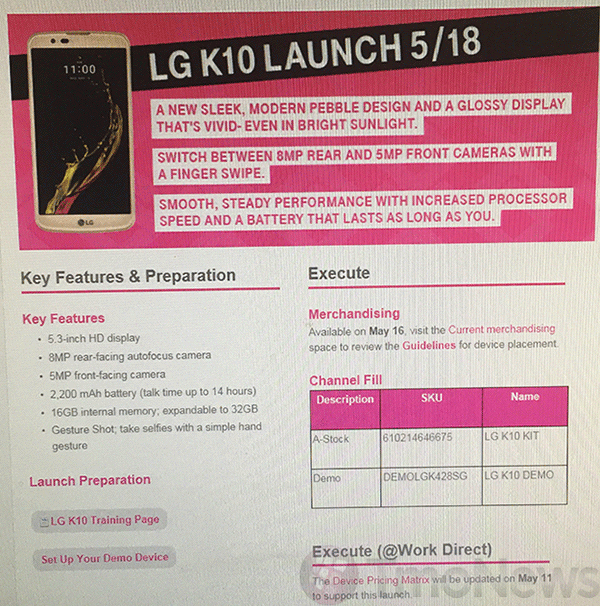 I may consider the lg k10 if priced reasonably. I am almost certain they will price the galaxy too high as tmobile tends the do. The k7 at 140 for a snapdragon 210 non hd resolution no nfc and no ambiennt light sensor if i recall correctly. zif the k10 can replace the k7 then it will be a hit, but i doubt it considering they still often sell the stylo at tmobile (not walmart or other retailers) for 289.99. Like all of your videos on youtube btw, like that you cover devices from the low to high end. …any word on the HTC 10? When is HTC 10 coming to TMO !!?? Hopefully on MetroPCS, that J7 is a solid device. Would love to see Samsung Galaxy A9 Pro come to T-Mobile. I was on the HTC 10 webinar on Thursday last week. HTC 10 will be hitting the T-Mobile store on the 18th and customers can get a Ice View case for free when they purchase it. This is awesome, the 10 looks like the phone to beat. HTC runs Android like a charm so I’m excited for this. Pricing need to be competitive though cause $700 is just way too much to pay. God I hope your right, need a change…. When are they supposed to announce it? You work for T-Mobile? While it is always nice to see new phones coming out, I am really burned out on Android devices. I don’t even want to think of how much I’ve spent on these devices over the years. I feel like I’m just wasting my time and money buying Android, because no matter if I spend 50 dollars on a cheap device, or 500+ dollars I’ve learned to never trust any of these companies to give me timely updates or any updates at all. While I am someone who knows how to install unofficial updates, I’ve become sick and tired of doing that. Why? I feel like I shouldn’t have to do that anymore. Nothing has changed in the 5 years I’ve used Android devices. Same old story of “Want the next Android update?”, Spend another 500 dollars on a newer device in one year (sometimes even less than that), and trash your old one because its been made artificially out of date.” If the advice is to buy Nexus, that is basically saying, well, Google is the only company making actual Android phones and these other companies are just making forks of Android and are totally and completely incompetent, because they cannot support their expensive Android phones and tablets for a reasonable length of time. As far as I am concerned, all of these companies are useless to me if I want actual support for my 600 dollar purchases, all of which are now paperweights to them. It doesn’t encourage me to buy the next device they want to sell to me, in fact, it makes me and many others look elsewhere. These devices may get one update, but more likely, these updates will be delayed on purpose, so that if they do get an update it will only be ONE update. I guess their prices will reflect that, but it still leaves me feeling negative about how incompetent these companies are when it comes to to after sale software support for their very expensive devices, never mind the “budget” phones they sell. My windows phone from 3-4 years ago is still getting updates today. Just saying. It’s an Android thing…It’s one of the many reasons I don’t use Android because I am already likely buying outdated hardware that likely wont get an update and if it does, it is super late and the next release is almost out. Windows don’t even have a fraction of the apps andriod has. I got rid of mine after 3 months waste of 40 dollars. You’re right; if Apple hadn’t stopped being innovative they’d be getting more and more business. But they *have* stopped innovating significantly, and their software is more buggy than it used to be (although still pretty good IMO). I had the original Android G1 from the time it launched, and then two Verizon Android phones after that – an LG and an HTC Rezound. After even replacing the stock HTC battery with HTC’s extra fat replacement battery (and its corresponding fat back) the HTC failed to give me good battery life – so I gave up. I then got the recently released iPhone 5 and have upgraded my iPhone every year since then. Interestingly, not only is that same iPhone 5 still supported by software iOS updates, but even the 4s before it! I’m still happy with my iPhone experience, overall. I’ve had even worse experience (lack of updates) with Samsung and their Galaxy tablets and Android Galaxy Camera I still own. Yes, I’m afraid the reason that Android users are constantly looking for the next update is because the current release never seems quite right. I hope this mid range device isn’t as terrible as the galaxy avant mid range phone. Boot loops, dropped calls and a ton of other bugs Samsung refuses to acknowledge. The 1.5/16gb version I never had any problems with. It’s nice to see this after the plethora of 1/8gb stinkers. I do think though, that we should henceforth label 2/16 entry level, mid should be 32-643. Come on, make the phones smaller! Not everyone has size issues. This size in the middle offends just about everyone, too big for half, too small for the other half. I wonder which one supports adaptive storage. All these low to mid range devices from T-Mobile should, by default, support adaptive storage.